What does employee engagement look like at your organization? And more importantly, what is the primary reason to invest in it? Research shows that it is worth investing in because employee engagement levels are interwoven with business outcomes. Simply put, the most important reason is because it relates directly to your employee’s willingness and ability to help you succeed. As for what it looks like at your organization, that is a big question and difficult to answer because you can’t ask an employee if they are engaged. What does that question even mean exactly- are you engaged? Being engaged is a combination of several different attributes, that sweet spot where employees love where they work, what they do and are proud to work for you and feel they are getting something back from you that makes it all worthwhile. Engaged employees are your best employees, productive and willing to go above and beyond. If you have lots of them, you are lucky because that is what most of us are shooting for but have difficulty obtaining. We know it is important, yet the truth is most of us really have no idea what employees think or want. So, if turnover or morale is a problem for you, it might be time to get to the bottom about what is going on. To even begin to understand the employee engagement challenge and where you stand with your employees, you need data. This is not a time to guess what is going on, instead you need to ask everyone what they are experiencing about how they feel and what they think and the very best way is the proven way, with an employee survey. Still not convinced? Let's take a step back and refresh why this is so important. From Abraham Maslow, we learned that we can’t achieve higher goals until we have the necessities of life, and this same theory applies to our work. Employees must have their basic needs met before they can grow to become our most committed, loyal and engaged employees. 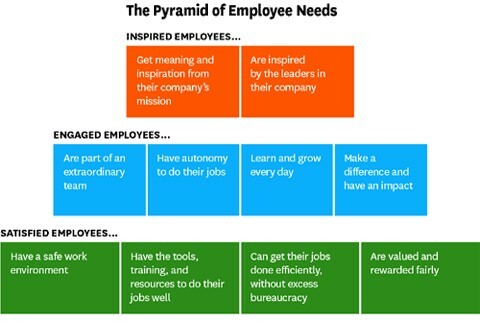 We value this pyramid illustration because it clearly depicts the foundation every organization needs to establish as a base and what steps have to be taken to grow and achieve the highest step -- an inspired, engaged and motivated workforce. No employee survey company can get you to the top of the employee engagement pyramid based on a survey alone but a well-designed survey will get you the insight you need to see where you stand so you can begin to implement a plan to achieve meaningful goals.After 20 years of conducting employee research, we have developed a survey that gets to the root of what is driving your employees…our questionnaire along with our analysis and recommendations for action, gives you the insight you need to take action and make changes that matter to the people who work for you. We hope you will get in touch if you are curious to know more. At the very least we can send you our proposal so you can see our methodology and what it would cost. It is a good place to start. Please go here to request a proposal and quotation.